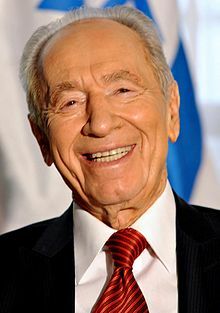 Shimon Peres (Hebrew: שמעון פרס‎; born Szymon Perski; 2 August 1923 – 28 September 2016) was a Polish-born Israeli statesman. He was the President of the State of Israel. Peres served twice as the Prime Minister of Israel. He also served as Interim Prime Minister twice. Peres has been a member of 12 cabinets. His political career spanned over 66 years. He was one of three leaders who shared the Nobel Peace Prize in 1994. The others were Yitzhak Rabin and Yasser Arafat. All three got the prizes for trying to make peace in the Middle East. On September 13, 2016, Peres, aged 93, suffered a severe stroke and was hospitalized in Ramat Gan, Israel. He had suffered a massive brain hemorrhage. Two days later, he was reported as being in a serious but stable condition. However, on September 26, an examination found damage to his brainstem. He died on September 28 of complications from the stroke. ↑ "Shimon Peres, former Israeli president, dies aged 93". www.bbc.com. BBC. Retrieved 28 September 2016. ↑ YNetNews.com, "President of Israel, Shimon Peres"; retrieved 2012-9-18. ↑ Ravid, Barak; Efrati, Ido (14 September 2016). "Former President Shimon Peres in Induced Coma After Suffering Major Stroke" – via Haaretz. ↑ staff, T. O. I.; AFP. "Peres to remain sedated, condition still 'serious but stable'". www.timesofisrael.com. ↑ "Former Israeli President Shimon Peres' Medical Condition Deteriorates After Major Stroke". 27 September 2016 – via Haaretz. ↑ Baker, Peter (September 13, 2016). "Shimon Peres, Former Prime Minister of Israel, Suffers a Stroke". The New York Times. ISSN 0362-4331. Retrieved September 28, 2016. ↑ Wohlgelernter, Elli (September 28, 2016). "Shimon Peres, former president and veteran Israeli statesman, dies at 93". The Jerusalem Post. Retrieved September 28, 2016. Wikimedia Commons has media related to Shimon Peres.